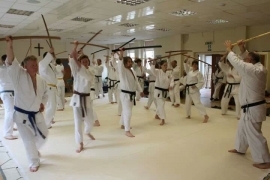 Sword training is of particular benefit to practitioners of Wadoryu Karate and Jujitsu, encompassing the strategy, movement and evasion techniques in both of these arts. "Iai to wa, hito ni kirarezu, hito kirazu Jiko no renma ni, shugi no michi." We conduct training sessions every Friday at 6.30pm, immediately before our Wadoryu Karate session, with the first lesson free. There are various methods of noto, resheathing the drawn sword, of which eight of them are incorporated into the system. The Toyama Ryu technique of guiding only one third or one half of the blade into the scabbard is standardised throughout. This differs from the old-school technique in which the full length of the blade is dragged across the back of the left hand until its tip slips down into the scabbard mouth. 1. From chiburi, the right hand elevated as it draws the back of the blade across the left hand [Toyama Ryu]. 2. 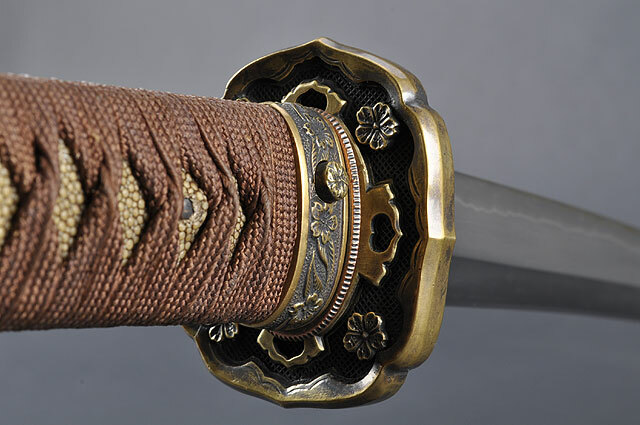 From yoko ichimon-ji, so named because the sword looks like the horizontal Chinese character "one" [Omori Ryu]. 3. Overhand grip from chudan gamae. 4. Overhand grip, after right kesagiri. 6. From the reverse-sword position after left kesagiri, blade resting on right knee [Omori Ryu Iaido]. 7. From the reverse sword position after right kesagiri, blade on the left knee. 8. From blade forward. Left hand grasps the koiguchi while the blade tip is concentrated on your opponent; then noto.